Do you really want to know what it’s like to be a hairdresser? After being in the hairdressing business for thirty three years I think I’ve learned a thing or two. My novel, Towel Dry and a Good Cry, a kindle book, is my interpretation of what it’s like to really stand behind the chair. 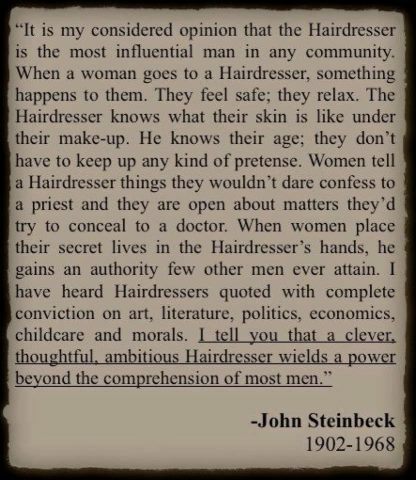 Being a hairdresser is not just about cutting hair. Beauty school doesn’t prepare the hairdresser for the real world of dealing with the public and being a confessor. 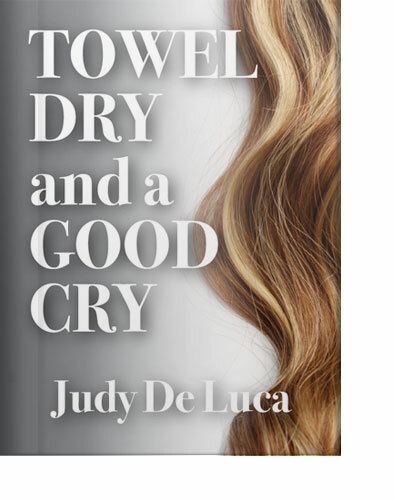 Towel Dry and a Good Cry will walk you through the life of, Josie Capelli, the main character, a new to the business hairdresser in the early eighties, her crazy best friend and her drama filled Italian family. Hairdressers world-wide would agree it doesn’t matter what country you live in the hairdresser/client dynamic is always the same. And as John Steinbeck so eloquently put it in this quote, is my sentiment exactly. This entry was posted in Blog, Books, Cosmetology, Cosmetology kindle book, Hair/Beauty, Hairdresser, Towel Dry and a Good Cry and tagged beauty industry, books, Cosmetology, fiction, hairdresser, kindle books by judydeluca. Bookmark the permalink.